Posted July 20th, 2016 by Sean Fredricks. Sharps related injuries are unfortunately still too common. Prevention and training are key factors to mitigating risk. According to the CDC, there are approximately 385,000 needlesticks and other sharps-related injuries to hospital-based healthcare personnel each year, which is why sharps safety is one of the top concerns in the medical community. On November 6, 2000, President Clinton signed The Needlestick Safety and Prevention Act (H.R. 5178), which codifies and strengthens federal OSHA’s Bloodborne Pathogens Standard. Sharps is actually the medical term for a sharp-pointed object that can cut or puncture the skin, and this includes needles, syringes, lancets, auto-injectors, and connection needles. The most common infections occupationally transmitted via sharps injuries during patient care include hepatitis B, hepatitis C, and HIV. Fortunately, the majority of sharps injuries are preventable. Perhaps the clearest strategy for prevention is the elimination of sharp instruments whenever possible; for example, a surgeon has many alternative instruments to rely upon, such as electrocautery. Of course, elimination is not a possibility for busy labs, doctors’ offices, and even assisted living facilities. 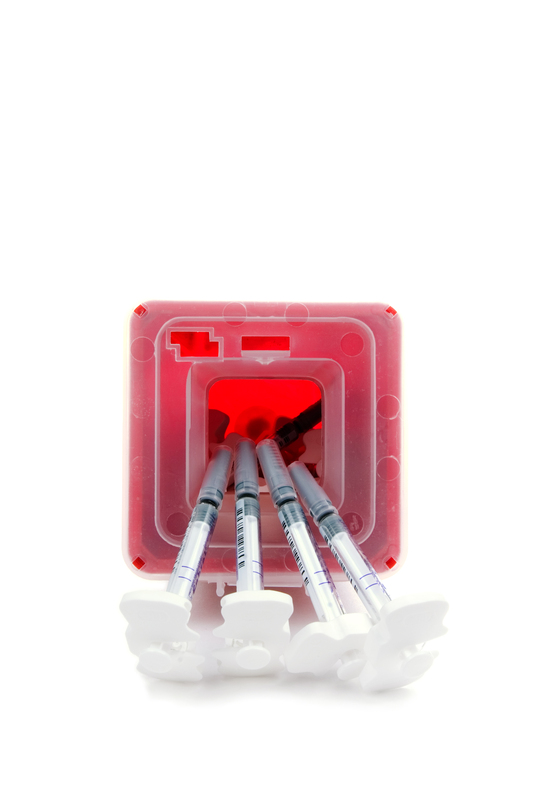 Implementing a sharps safety program is the best defense against sharps-related injury. OSHA recommends that institutions look at their needle devices to determine safety and check how sharps are being handled and disposed of. Relying on safer needle devices, such as those that have built-in safety control devices or those that use a self-sheathing needle can mitigate risk of injury. 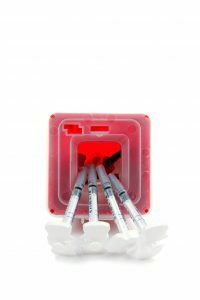 The FDA also states that sharps containers must absolutely be discarded when reaching the fill line on the label, which is approximately ¾ full. To avoid contamination and injury, containers should not be overfilled. At the end of the day, successful prevention is always the result of successful training. MedXwaste offers an online OSHA Compliance Training program that covers everything facilities need to know to keep employees safe, including bloodborne pathogen standards. An emphasis on employee safety helps you protect your well-trained and valuable team. MedXwaste also offers approved bins, red bags, and sharps containers so you can further ensure sharps safety within your organization. A sharps management program is a proactive service to help healthcare facilities improve employee safety and to control the cost of doing business while protecting and preserving the environment.